This week, I’ve been mostly living as a Stone Age Hunter-Gatherer. Well… maybe just a gatherer. 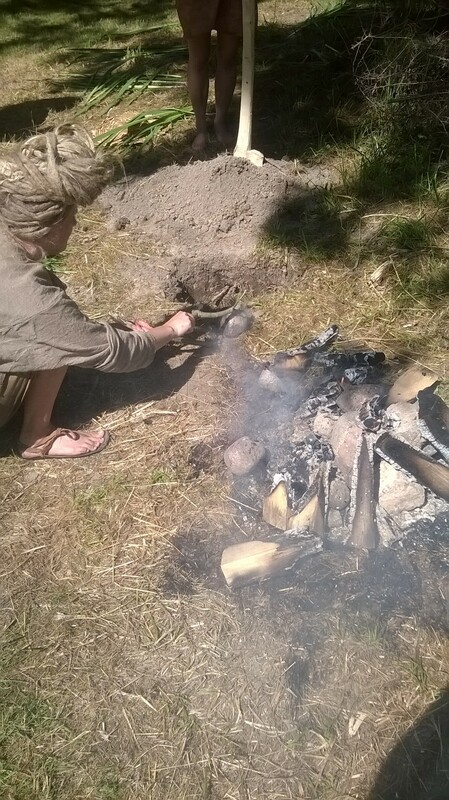 Every year primitive technology specialists, archaeologists, flint knappers and…me, head to Lejre to take part in it’s annual ‘Athra Stone Age Gathering’. A chance for the public to witness life, hunting techniques, food, artefacts and tools from the earliest human hunter-gatherers to the first farmers. I was tentatively plonked in a newly cleared patch of scrubland, on my own, dressed in leather pants and a waistcoat and labelled the Neolithic. Armed with an array of roughly flaked flint tools and an ‘auroch’ femur, I was asked to chop down some trees and make a plough. Easy. Needless to say I got horribly distracted, preferring to spend my first couple of days hafting freshly ground stone axes for Tom, an Experimental Archaeology MA student from Exeter University and then proceeding to butcher a birch tree (all in the interest of scientific research I’ll have you know). It was an overwhelming experience, wondering round the various camps, jumping thousands of years through time and witnessing some incredibly talented craftspeople cooking, tanning hides, processing plant fibres, knapping flint, working bone and antler or just sunning themselves in their loin clothes. Boating across the Stone Age lake. Processing reeds to make a bundle boat. Once I settled into the relaxed rhythm of Neolithic life with a couple of Swedes, I realised that living in the new Stone Age was a breeze, we took the approach that as it was Summer, our crops would of been planted, therefore we could enjoy the finer things in life. 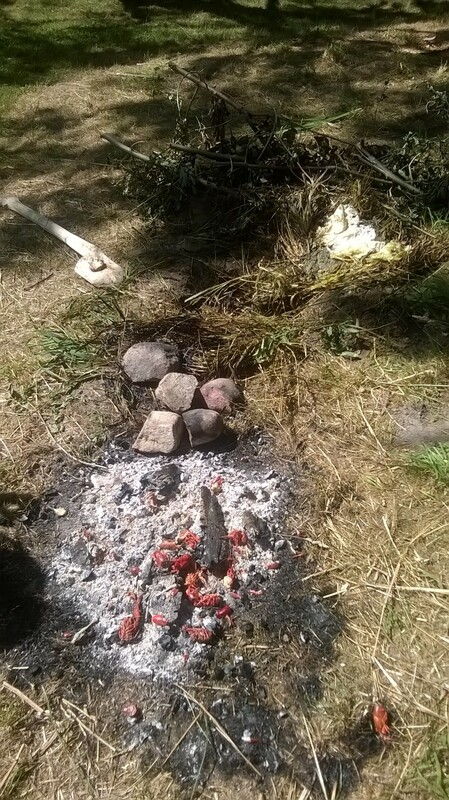 We had a glutinous crayfish extravaganza one day; lounging round a bubbling pot on the fire, picking the bright red shellfish out and gobbling them up. The second day we exerted substantially more effort and took things a step further. 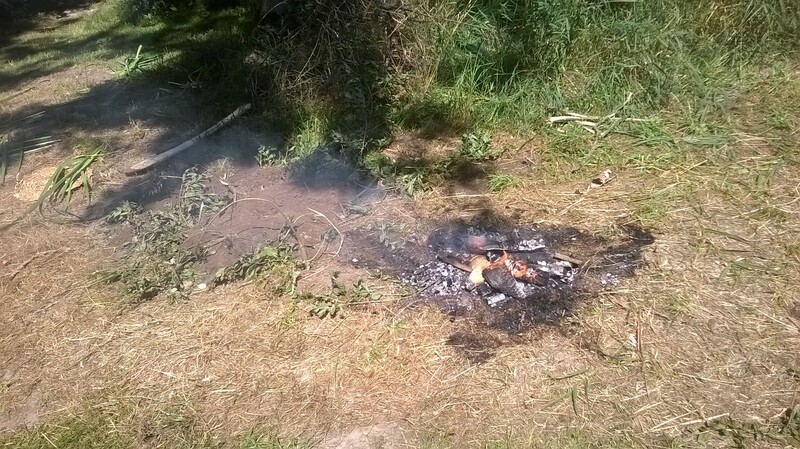 It started with me making a wooden spade, digging a big hole, lighting a gurt fire, heating up a pile of rocks, chucking them in the hole, adding parcels of delicately wrapped parcels of meaty and fishy goodness, adding more hot rocks, then burying the whole thing in soil. We then lounged and sampled the Swedish delicacy of surstromming (fermented herring)- it was almost as delicious as it sounds. 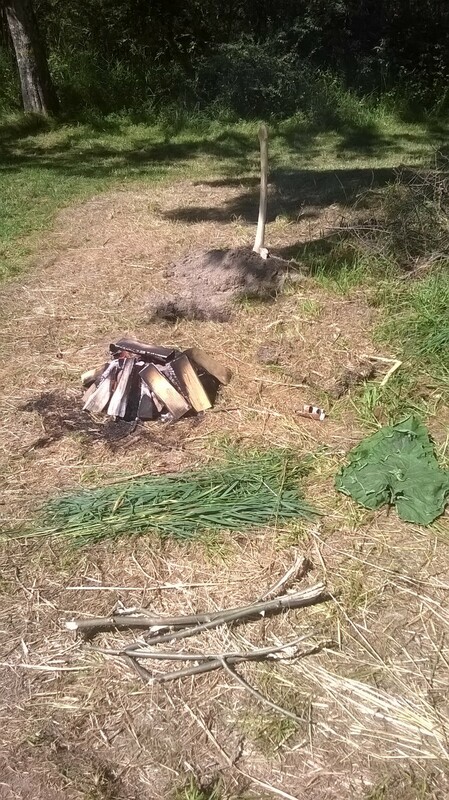 After gagging for an hour or so, we unearthed our feast and as if by magic our lonesome Neolithic clearing became a multi-period lunchtime meeting place. Sagnlandet Lejre, is one of the largest and oldest open air museums in Europe. It occupies a beautiful valley half an hour west of Roskilde, complete with lakes, marshland, streams, forests, fields and common. Within this, one can wonder from a 19th century small holding, through traditional craft workshops (including potters, weavers, dyers, blacksmiths) to a Viking village (soon to have the largest longhall in the world! ), on through an extensive Iron Age settlement, past Bronze Age megalithic monuments into a Mesolithic hunting camp. On the way you can paddle dugout canoes, shoot bows, take a lesson in archaeology, admire the ‘aurochs’, meander through the labyrinth and try to spot their wild boar. The whole landscape is carefully thought out, with traditional breed sheep and goats grazing the common, extensive food and medicinal gardens, along with beautifully managed meadows and wetlands. The difference between Lejre and the Middelalder Centret is signage- Lejre’s experience is self-directed, with visitors working their way through the park gleaning knowledge from the numerous info panels dotted conveniently at each spectacle. The areas are bought to life through staff, volunteers and by members of the public paying for the privilege of living like a 19th century peasant or iron age farmer for a week (an incredibly clever and innovative business model, utilising the Dane’s passion and pride for their heritage).